Keeping the muscles in your legs flexible is essential, because you use them on a daily basis. Your tibialis anterior muscle, for instance, is located at the front of your shin and is attached to various bones in your foot by the tibialis anterior tendon. This muscle is responsible for moving your foot and ankle toward your head and inward. Performing various stretches for your tibialis anterior helps keep the muscle loose and pain-free. Tibialis anterior tendonitis refers to inflammation and degeneration of the tibialis tendon due to overuse or excess force. You will feel discomfort at the front of your ankle or foot as you walk or run. If left alone, the pain usually worsens over time. Contributing factors to tibialis anterior tendonitis include poor flexibility, improper training and biomechanics, weak muscles and poor-fitting footwear. Performing regular stretching for your tibialis anterior muscle will help you avoid some of the risk factors associated with tibialis anterior tendonitis. To stretch your shins from a kneeling position, you must place your shins flat along the floor underneath you. The top of your feet should also be on the floor. Gently lean back toward your heels until your feel a stretch in your shin area. Hold the stretch for 10 to 30 seconds. 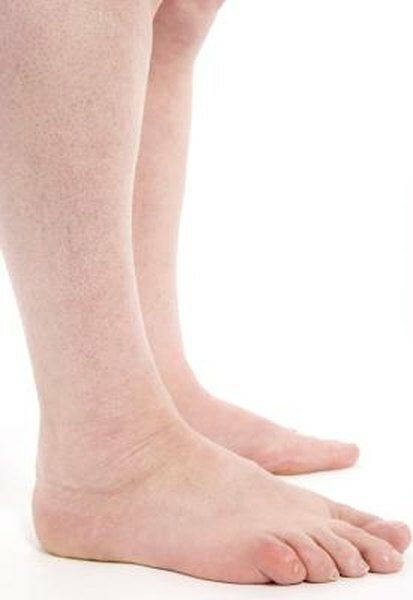 To perform the shin stretch from a standing position, cross your right foot in front of your left and place the toes of your right foot on the floor on the outside of your left foot. Bend your left leg slightly so your right ankle is pushed toward the floor. Hold the stretch for 10 to 30 seconds and switch sides. The lunging stretch for your tibialis anterior muscles resembles an achilles tendon stretch, but with a couple differences. Assume a position similar to an achilles stretch with your hands on a wall, one foot forward and one back behind you. With this stretch, raise your back heel off the floor and move your front knee over your toes. Hold the stretch for 5 seconds and repeat 10 times on each leg.